WHITE SULPHUR SPRINGS, W.Va. — Any devoted golf aficionado should want to visit Oakhurst Links, long billed as the first golf club in the United States. 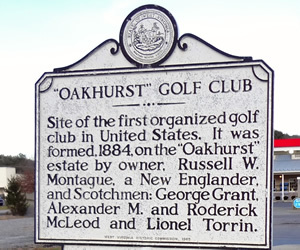 A book — “Oakhurst: The Birth and Rebirth of America’s First Golf Course’’ (by Paula DiPerna and Vikki Keller, Walker and Company, 2002) — was even written about this nine-holer, which dates to 1884. That’s well before the country’s first 18-holer, Wheaton’s Chicago Golf Club (1892). So, en route to a winter in Florida, a side trip was planned to this little known town, best known for being the site of the famous Greenbrier Resort. I’d read Oakhurst’s history book, which detailed how Russell Montague had built a course on his estate and enjoyed it with some neighbors before converting it into a horse farm. Golf was apparently played on the property until 1912. There is no doubt about that. Much later Sam Snead, who grew up nearby, was photographed hitting balls on the overgrown property. As ownership of the property changed, Snead urged Oakhurst’s reconstruction and architect Bob Cupp took on the project. Using any resources he could get, Cupp revived Oakhurst as a 2,235-yard layout that was re-opened in 1994. Rounds were played with hickory-shafted clubs and balls similar to those of the 1880s. Players dressed in attire from that era, as well, and a national hickory championship tournament had been played there. Sounds like an interesting place to visit, right? Well, I would call my trek there weird more than interesting. An Internet search of Oakhurst Links proved sketchy. The course had financial difficulties, changed owners, was closed in 2008 but did apparently operate in 2010. Phone calls, made to Oakhurst over several days, were more puzzling. All you got was a voicemail that said the facility was open from 8 a.m. to 4 p.m. Tuesday through Sunday. You were invited to leave a message for a callback, but mine went unanswered. Nonetheless, this trip would go on — and with it the mystery deepened. With the presence of the nearby Greenbrier, you’d think someone in the little town of White Sulphur Springs would know something — anything! –about this historic location about five miles from the big resort. I couldn’t find any that did. First stop was at a gas station just off the main highway. Is Oakhurst still there, I asked an attendant after telling her about the unanswered phone calls. That was a distinct possibility, since the trip came in late December. Still, why not have a peek at this place while you’re in the neighborhood? Our GPS System led us to Oakhurst, sort of. We turned down Montague Road, a country trail somewhat off the beaten path, but the journey ended abruptly, with a road closure. Construction on a bridge kept us from going further, though the GPS said we were nine-tenths of a mile from our destination. So near, and yet so far. On the way back to the main road I spotted a historic marker at a nearby intersection (the only indication that Oakhurst indeed did still exist). It was located near another gas station. From there our trip went a couple miles back to the Greenbrier, both for sustenance and more information. The guard at the gate knew of an old golf course five miles away in the hills, but that was about all he knew. A visit to Greenbrier’s Sam Snead Pub for dinner didn’t produce much more information. The first waitress, saying she’d been on the job only three months, hadn’t heard of Oakhurst. She brought over another waitress, who had lived in the area a bit longer. She didn’t know much, either, but called over a waiter who described himself as a regular at area courses. “I’ve never played (Oakhurst),’’ he said, “but I know it’s there.’’ But he didn’t know if it was still in operation, and hadn’t even noticed the historic marker on the road leading to the course. All the people we talked to were extremely friendly — especially those at the Greenbrier — and they tried to be helpful. Still no one — even those living within the little town — knew much about America’s the first golf course. That seems a shame, given the historical significance of the place. 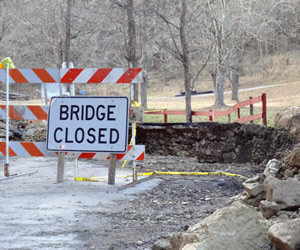 Advised of the bridge construction, the waiter thought another side road might get us to the location the following day, but that narrow road looked precarious the next morning — especially with rain pelting down at a good rate. So, my Oakhurst adventure wasn’t fruitful — but it did produce something to talk about within my golf circles. After our visit we received an inkling of what had been happening at the 30-acre property. The Links, as well as some of its memorabilia, were put on the auction block. The owner, Lewis Keller, was 89 years old and taking care of the property had become too difficult. Keller was willing to accept the best offer and finally retire to Lynchburg, Va., to live near his daughter Vikki. In November, 2012, the course was bought by Jim Justice, the Greenbrier owner. Though the price wasn’t disclosed Keller said the amount satisfied a $700,000 bank lien on the property.